Today is a grumpy day. A scowling, brooding, arms-crossed sort of day. Why? You’ve heard of these days? The ones where you wake up on the wrong side of the bed and everything and anything is just sort of annoying? That dust on the bathroom window sill? Dumb. Your morning workout? Ugh. Dumb. This bowl of blueberry yogurt? So dumb. Okay. Let’s snap out of it. Snap snap snap. We are not grumpy. We are lucky. So lucky! Lucky to live in California, where the sky is blue and the peaches are already in season. Lucky that our kitchen cabinets are painted purple, and that there are fresh flowers in our brand new bud vase. Lucky for our families. Our friends and our Bens. Lucky to be healthy and alive and wearing neon yellow sneakers. 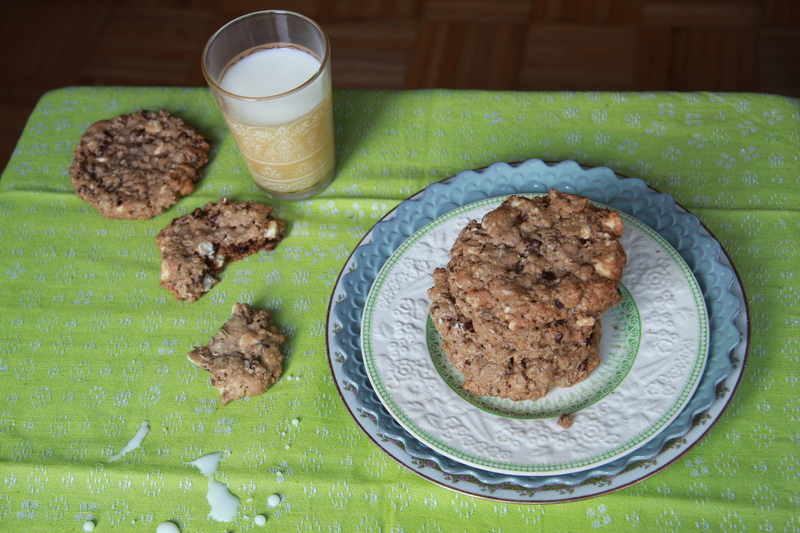 And lucky for the oatmeal chocolate chip cookies. On a day like this, one of these (multiples of these, I think we can agree), might be in order. Lucky us. 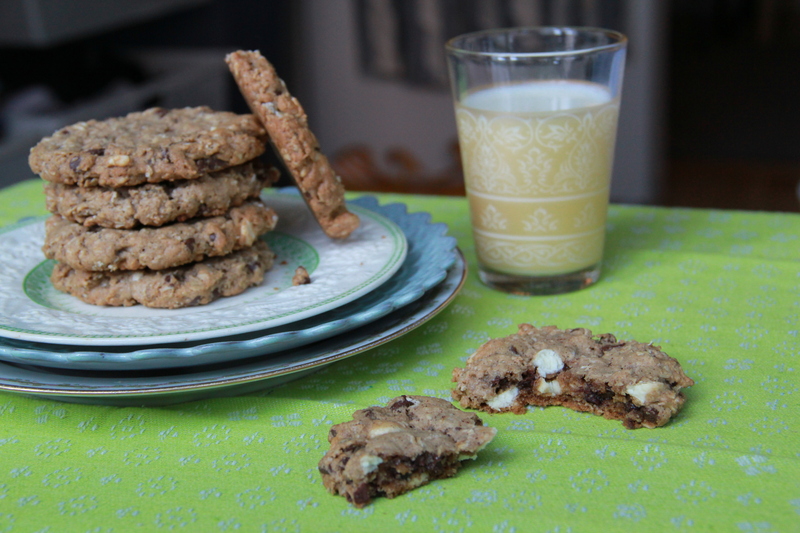 This is my absolute favorite cookie recipe, of the cookie recipes in my repertoire. Take that statement as you will, but keep in mind that I’ve made a lot of cookies in my day. I’m just saying. Note: feel free to substitute your favorite kind of chocolate in place of the dark and white here — I sometimes like to use a mix of bittersweet and milk, or else just entirely milk chocolate. It’s so milk of me. Preheat the oven to 325 degrees F, and lay parchment on top of 2 large cookie sheets. In a large bowl, whisk together the dry ingredients, from flour through rolled oats. In another large bowl, beat together the butter and sugars until light and fluffy. Add the vanilla and the eggs, one at a time, until smooth. Add the dry ingredients and stir gently to combine. Fold in the chocolate chips. Bake until cookies are slightly puffed and golden brown, roughly 10-15 minutes, depending on the size of your cookies. Allow to cool slightly before enjoying with some cold milk. Makes A LOT of cookies. Like 50.
these look DELISH. we are all lucky for YOU, miss molly! Yup. I know how you feel about the lucky thing. 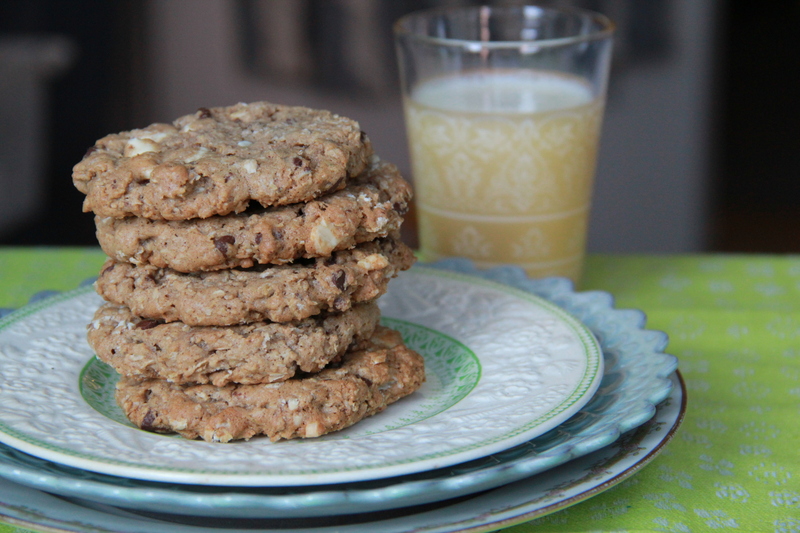 These cookies look perfect for a memorial day bbq dessert. Miss you. These cookies look perfect for a 4th of July bbq dessert, dontcha think?